MANILA, Philippines — The second Sun Life Cycle PH reels off today with over a thousand biking enthusiasts of all ages and skill levels setting out for a fun ride, wellness activity and family bonding at Bonifacio Global City in Taguig. 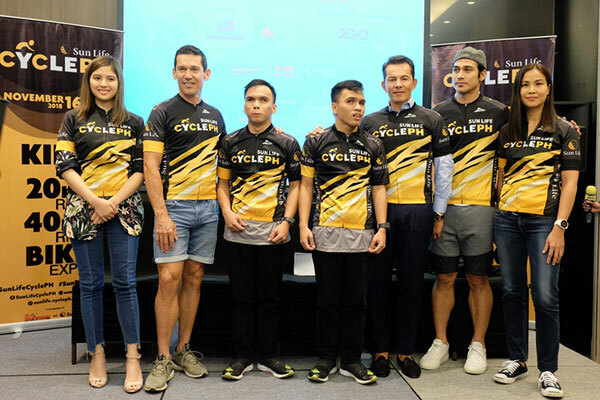 Participants also get the rare chance to ride with three-time Tour de France green jersey winner Robbie McEwen, who with SEI founder Wilfred Uytengsu graced yesterday’s press launch of the annual event, aimed at promoting a healthy lifestyle through cycling, at the SEDA BGC Hotel. “It’s not about cycling but also about pollution that endanger the health of the people and the surrounding as well,” said Uytengsu, also the man behind Ironman Philippines. For the first time, blind twins and former national athletes Jerome and Joshua Nelmida will participate in the centerpiece 40K Long ride firing off at 6 a.m., donning t-shirts with “Focus on my ability not on my disability” prints. They will be accompanied by coach Anthony Lozada. The big cast, including a number of Star Magic artists, also sets out for the Kids Ride and Short Ride (20K) categories around Taguig, Makati, Manila and Pasay. The 40-km race will start at BGC to Kalayaan Flyover to Gil Puyat Ave. to the turnaround point before Taft Ave. then back again to BGC, going through the course in three laps. The two-lap 20-km race, on the other hand, will make a turnaround at Ayala Ave. and back to BGC. Providing luster and prestige to the event are triathlon campaigners Matteo Guidicelli and Jake Cuenca along with fellow Star Magic artists Enchong Dee, Iñigo Pascual, Yong Muhajil, Janus del Prado, Sarah Carlos, Tommy Esguerra and Kisses Devalin. The event also offers a wide range of fun activities within the cycling and lifestyle expo for the entire family.